The Weekly Racer welcomes Late Model Stock driver Meagan Creech! Okay Meagan thank you so much for letting me get off track for a little bit there! First let me start by thanking you for taking part in this interview and having the patients while I worked on ironing things out! 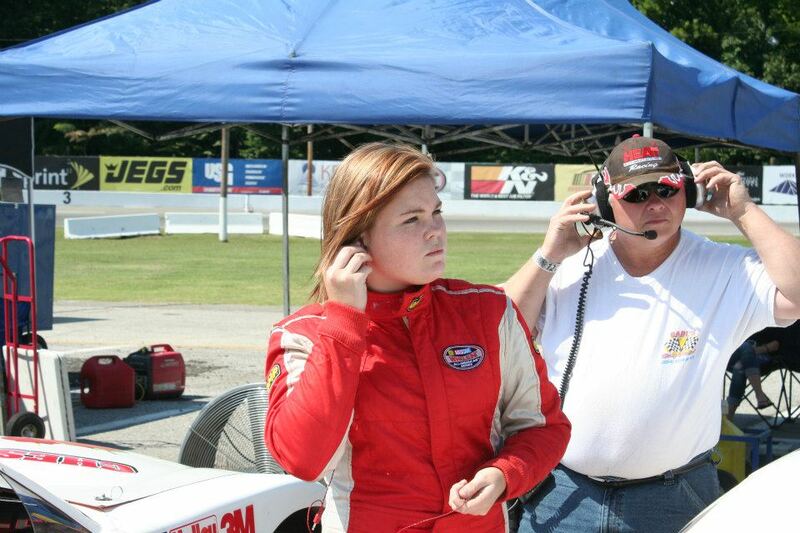 I truly enjoyed talking with Meagan and getting to know her from a racers perspective as well as a 20-year-old woman trying to make it in the world of late-model stock car racing. To my surprise Meagan did not get the urge to test her talents until the ripe ole’ age of sixteen. This is truly a shocker to me having a father who builds chassis for a lot of teams in this region of the country. I have grown up around racing my whole life, my dad builds chassis and what not but I did not take a real interest in it until I was 16 and then I was hooked. I am sure I am pretty accurate in saying the past four years must have been some of the most exciting, thrilling and frustrating times. Going from pretty much rookie status to proving what you can bring to the table in a national spotlight at the D4D Combine (Drive for Diversity) hosted again this past year by Langley Speedway. For those who may not know, the D4D program wrangles up some of the best young drivers around the nation. Testing their physical & mental strength, followed by a good amount of seat time. Meagan was one of those select few who received the call to make the trip to Hampton. “The D4D is actually one of my biggest accomplishments to date.” Heck to be selected for this combine would have to be a major accomplish for any driver at any point, to only have four years under your belt and getting the call, much props from this guy right here! She told me the combine tested everything from physical fitness to individual interview skills! Shoot must be doing something right at the combine just look at Kyle Larson (2012 K&N East ROTY & Champion, 2013 Nationwide ROTY, driver of the 42 Cup car in 2014). Look to see Meagan Creech back at the combine next year for sure! Before the interview was over I had to ask her why she thought it was difficult for woman to get into the sport. She felt it had to do with people looking down on woman and their ability. For years girls growing up were put into their own sport with different rules (girls basketball, girls soccer, softball, etc). People are programmed guys and girls are to compete separately. “A lot of people don’t always think we can hang with the boys but we can. No one knows when you put that helmet on and get in that car that you are a female.” No other statement could be more true in this entire interview… well okay second most only to her love towards Kasey Kahne could be more true! So let’s go ladies, lace up those boots, put the hair in a pony tail and strap in, help Meagan and other females out there prove you belong on the track! Meagan will look to add a victory under her belt in her late-model this year! Head over to her page to learn about the Meagan Creech outside of the race car! If you like her story, share similar interest or even have a special questions you would like to ask her. Please leave that in the comment section, I will make sure she get them and get a response to you. Anyone interested in helping her this season, please contact her and help this girl get on the track to show the boys she belongs!